New Ideas in…: the Marshall Attack (10 part series). C89: Ruy Lopez: Marshall counter-attack, Ruy Lopez: Marshall counter-attack, 11...c6, Ruy Lopez: Marshall, main line, 12.d2d4. One of the world’s first Grandmasters of chess, America’s Frank J. Marshall (1877-1944), left behind a lasting legacy to the chess world with his revered gambit against the Ruy Lopez – the Marshall Attack with 1 e4 e5 2 Nf3 Nc6 3 Bb5 a6 4 Ba4 Nf6 5 0-0 Be7 6 Re1 b5 7 Bb3 0-0 8 c3 d5! 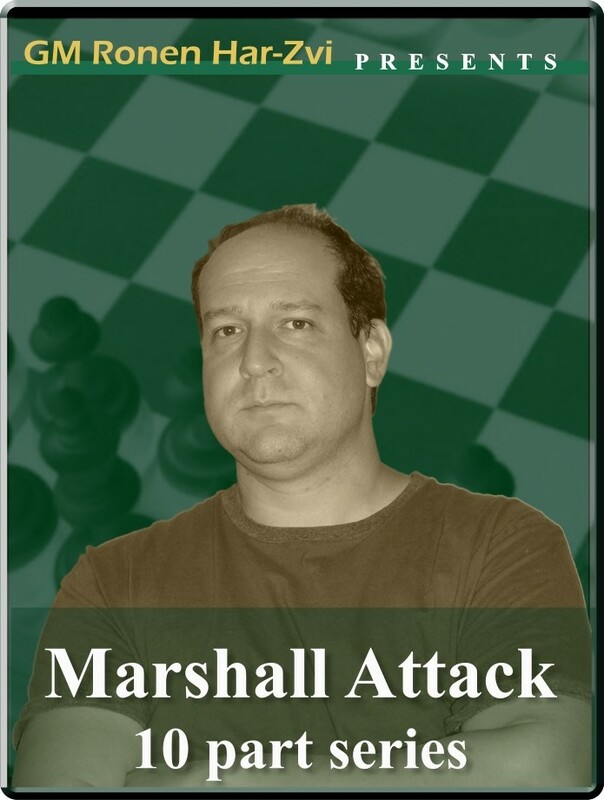 The Marshall Attack is one of the most important openings in the history of chess and is still deployed with regularity at super Grandmaster level. In current theory the ideas and strategies of both approaches are studied in-depth, and nowadays experts have come to the conclusion that White has no clear superiority in the main theoretical lines. And in the latest of his "New Ideas in..." series, GM Ronen Har-Zvi, takes a closer look under the microscope at Marshall's revolutionary idea. New Ideas in…: the Marshall Attack (10 part series). C89: Ruy Lopez: Marshall counter-attack, Ruy Lopez: Marshall counter-attack, 11...c6, Ruy Lopez: Marshall, main line, 12.d2d4. One of the world’s first Grandmasters of chess, America’s Frank J. Marshall (1877-1944), left behind a lasting legacy to the chess world with his revered gambit against the Ruy Lopez – the Marshall Attack with 1 e4 e5 2 Nf3 Nc6 3 Bb5 a6 4 Ba4 Nf6 5 0-0 Be7 6 Re1 b5 7 Bb3 0-0 8 c3 d5! The Marshall Attack is one of the most important openings in the history of chess and is still deployed with regularity at super Grandmaster level. In current theory the ideas and strategies of both approaches are studied in-depth, and nowadays experts have come to the conclusion that White has no clear superiority in the main theoretical lines. And in the latest of his "New Ideas in..." series, GM Ronen Har-Zvi, takes a closer look under the microscope at Marshall's revolutionary idea.